Having said that, the labor sector will campaign among their members not to vote for candidates who do not support the opposition against the proposed sugar import liberalization during the upcoming national and local elections in May. 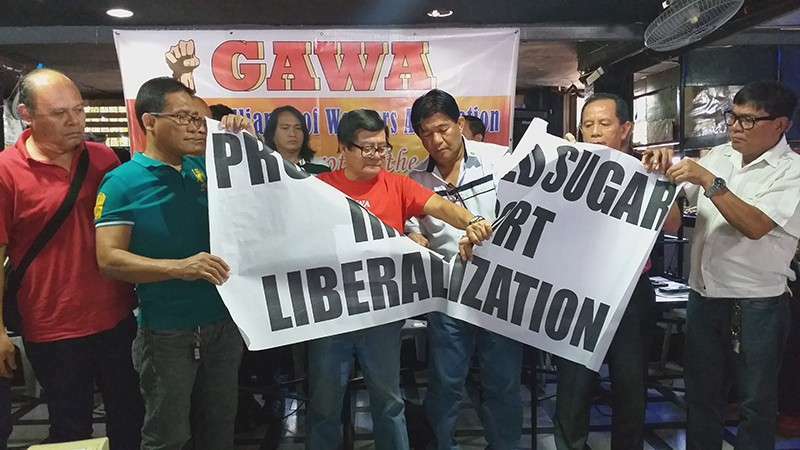 Save the Sugar Industry Movement (SSIM) convenor Wennie Sancho, during the Workers Forum held at Gerald’s Restobar in Bacolod City on Thursday, February 7, said congressional and senatorial bets sympathizing with the proposed sugar import deregulation are “anti-workers” and should not be voted. Sancho, also the secretary-general of General Alliance of Workers Associations, said if the entire local labor sector unites, it will have a significant force during the midterm polls. In solidarity, the labor leader stressed that they will have a voice including that of their families for the sake of the survival of the sugar industry. Hernane Braza, co-convenor of SSIM, said there is no reason for the labor sector to vote anti-worker candidates. There’s a need to prevent these bets to occupy government post without helping the sugar industry, she added. Braza, also the national president of the Philippine Agricultural Commercial and Industrial Workers Union - Trade Union Congress of the Philippines, said they will campaign among their members and voters within the organization’s leadership. In Third District alone, he said they have at least 5,000 member-voters on top of those from other affiliate-organizations in the province. “We are confident that we can be able to draw support from our members and their families, in the form of votes, as we are pushing the collective interest of sugar industry stakeholders,” Braza added. As the labor groups manifest their “burning” opposition towards the proposed sugar importation measure, they are eyeing the possibility of declaring persona non grata National Economic and Development Authority Secretary Ernesto Pernia and Trade and Industry Secretary Ramon Lopez. “Persona non grata” is a Latin for a person who is unacceptable or unwelcome. It can be recalled that labor groups in the province hit the two cabinet secretaries along with Budget Secretary Benjamin Diokno and the administration’s economic managers for reportedly pushing for the sugar import liberalization scheme. In a new development, the SWSI and SSIM along with 25 affiliate-organizations attending the forum proposed that if the two secretaries will continue their effort to push through the liberalization plan, they will draft a resolution declaring them as persona non grata by the labor sector of Negros Occidental. “Pernia and Lopez should cease and decease from any and all attempt to push through with the sugar import liberalization with due respect to the resolution passed by the Senate,” they added. Moreover, the labor groups have called on the members of the House of Representatives to also stand up by showing concrete support to the sugar farmers and workers through one, passing a resolution like that of the Senate. On Wednesday, 10 senators adopted a resolution calling on the Executive Department to abort the proposed sugar import deregulation plan to safeguard the economy and welfare of sugar farmers and workers in 28 provinces in the country including Negros Occidental. Sancho said the resolution passed by the Senate is a validation that the labor sector was right all along in their efforts to oppose such plan of the government. “The House of Representatives should do the same in order to manifest their position that they are pro-workers,” he added. Meanwhile, despite the growing support to the push for scrapping the proposed sugar import liberalization, the local labor sector there’s a need not to lower their guards thus, opposition efforts are on. The symbolic tearing of “Proposed Sugar Import Liberalization” replica on Thursday, manifest their condemnation to the measure seen to kill the country’s sugar industry and would cause hunger, economic crisis, and social unrest. After the forum, the groups will furnish the Sugar Regulatory Administration a copy of the Statement of Solidarity signed by their leaders and representatives.